Valid Online only. Excludes Wellness Specials, Clearance, Gift Cards, and Vitamin World Apparel. Valid on select items. Discount taken off regular price. Buy 1 Get 2 Free is mix and match; 2 free items must be of equal or lesser value. Cannot be combined with other promotional offers; not valid on prior purchases; other exclusions may apply; while supplies last; void where prohibited. Expires 4/26/2019. Home | Herbs & Holistic Health | Herbs A-E | Alfalfa 500 mg.
Free item must be of equal or lesser value. Buy 1 item at regular price and get a 2nd item free. Add 2 of the eligible items to qualify for the discount. items added to your cart. Alfalfa is widely grown in western Asia and the eastern Mediterranean region. Traditionally, Alfalfa has been brewed as a tea, although the sprouts are popular in salads. Alfalfa is an excellent addition to your nutritional wellness program. Directions: For adults, take three (3) or more tablets daily, preferably with each meal. Other Ingredients: Vegetable Cellulose, Dicalcium Phosphate, Silica. Contains <2% of: Vegetable Magnesium Stearate, Vegetable Stearic Acid. Warning: If you are pregnant, nursing, taking any medications or have any medical condition, consult your doctor before use. Discontinue use and consult your doctor if any adverse reactions occur. Keep out of reach of children. Store at room temperature. Do not use if seal under cap is broken or missing. Alfalfa 500mg is rated 5.0 out of 5 by 4. Rated 5 out of 5 by SoCalGal from Good Product Great product been using for years. Will continue to be part of my daily vitamin pack. Rated 5 out of 5 by Hambone from Great Product! Great Product! Great Price! Rated 5 out of 5 by bboopmd from Loved it! I take it everyday for complete good health. Rated 5 out of 5 by Anonymous from excellent product I have used your vitamins for quite some time and have always been very pleased with the results, at a much lower price than retail stores, especially when BOGO sales deals. Also the service is great. to make your inbox a happier place. **These statements have not been evaluated by the Food and Drug Administration. These products are not intended to diagnose, treat, cure or prevent any disease. The information provided on this site is intended for your general knowledge only and is not a substitute for professional medical advice or treatment for specific medical conditions. Always seek the advice of your physician or other qualified health care provider with any questions you may have regarding a medical condition. The information on this website is not intended to diagnose, treat, cure or prevent any disease. Never disregard medical advice or delay in seeking it because of something you have read on the Vitamin World site. Products sold on this site are for personal use and not for resale. All orders placed through this website are subject to Vitamin World acceptance, in its sole discretion. 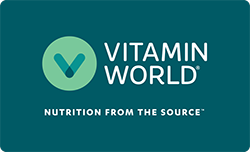 This means that Vitamin World may refuse to accept, or may cancel, any order, whether or not it has been confirmed, without liability to you or any third party. Vitamin World may refuse, or limit the use of, any coupon and/ or return for any reason, including reoccurring disruptive behavior. Reproductions will not be accepted. †Free shipping valid only within the contiguous 48 U.S. states; valid online and by phone only; minimum purchase requirement excludes tax; free shipping will automatically apply to your cart at checkout. Expires 4/30/2019. ‡Valid Online only. Excludes Wellness Specials, Clearance, Gift Cards, and Vitamin World Apparel. Valid on select items. Discount taken off regular price. Buy 1 Get 2 Free is mix and match; 2 free items must be of equal or lesser value. Cannot be combined with other promotional offers; not valid on prior purchases; other exclusions may apply; while supplies last; void where prohibited. Expires 4/26/2019. ††Excludes Wellness Specials, Clearance, Gift Cards, and Vitamin World Apparel. Valid on select Vitamin World® & Precision Engineered® brand items. Discount taken off regular price. BOGO Free is mix and match; free item must be of equal or lesser value. Cannot be combined with other promotional offers; not valid on prior purchases; other exclusions may apply; see store for details; while supplies last; void where prohibited. Expires 4/30/2019. *Valid Online only. Excludes Wellness Specials, Clearance, Gift Cards, and Vitamin World Apparel. Valid on select items. Discount taken off regular price. Cannot be combined with other promotional offers; not valid on prior purchases; other exclusions may apply; while supplies last; void where prohibited. Expires 4/30/2019.